Protip: Don’t buy a house in the country unless you check out the internet connection first. I didn’t take this advice and I’ve regretted it every day since we moved. 3 years ago, we moved to a beautiful property in the country, just north of Toronto. Lots of room, lots of fresh air and unbeknownst to me, no internet. That means no DSL and no cable. Until recently, we used a 3G based service from Rogers. Until Rogers decided to uncap our monthly bill and charge us $10/GB over 10GB of usage per month. My monthly Internet bill skyrocketed from $126 per month to a whopping $700 per month. Needless to say I called them and worked out a slightly better payment for the overage (nothing). Once I got the right people on the line, they were really gracious about it although I still think it was really unfair of them to start charging these rates with no notice. And worse, I had no alternative service I could look to. I decided to try their 4G/LTE service because it would give me 30GB of transit for just $150/month and I’d only have to pay $5/GB over the first 30GB. I figured that at most I’d be paying $190 per month for home Internet. That didn’t work either. Their new 4G/LTE devices don’t support an external antenna which I need to catch a signal where we live. Sigh. So I cancelled that today and took my very last option and signed up with Xplornet. Their service looks promising enough. Up to 5mb/s satellite Internet, 60GB of transit for just $90/mos. It all sounds really good on paper, except I’ve heard lots of terrible stories about their service. I hope that it isn’t as bad as people make it out to be. If it is, we may just have to move. There’s a catch though. The installer won’t be here for another two weeks. 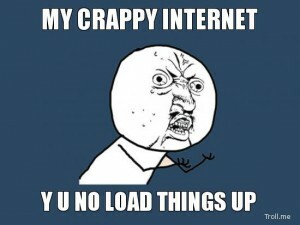 That’s two weeks of no Internet at The Bunker. I think I have a solution though. I found that if I perch my iPhone just right on the back of the couch, I can catch a 3G signal. That’s just enough to drive a low-speed “Personal Area Network” using the iPhone’s tethering features. I’m getting about 600KB up and 50KB down. I won’t be doing any massive torrents or anything, and it should be enough for me to grab my email and mess around with Twitter here and there. In any event, I could use a break so if you don’t see much from me in the next week or so, you’ll know why. You use alot of internet. I guess this is why its faster now in the evenings since you haven’t had access? Yeah. More pr()n for you I guess. Strike the Bunker off the Christmas visit list. No Pr()n, No Way.